I believe there’s an energy that connects everything. An energy that has been given different labels and inferences across languages, times, cultures and beliefs. But regardless, exists alike in effect. Depending on what you believe, or don’t, I may be like the Queen from Lewis Carroll’s Through the Looking-Glass each morning… “Why, sometimes I’ve believed as many as six impossible things before breakfast”. Because in that first quiet consciousness at the beginning of each day, I try to take a few moments of the interlude between sleep and awake to tap into the energy that connects us. This is the basic invocation I employ… it varies slightly from day-to-day as the words come from my spirit and my heart… if it’s early in the morning my thoughts may be a little fuzzy but the form creates itself and what it needs to convey, not usually less, and when necessary more specific & personal entreaties. Holding the energy and intent gently I converse with the spiritual entourage which are as much part of my life as the corporeal. Universe, Gods, Goddesses, Angels, Archangels, Guardian Angels, Spirit Guides, Higher Selves, Muses, Agents of Fortune, Loved Ones and All Beneficent Beings — Please watch over all our beings and forms. Please grant us wisdom and discernment, and change with ease and grace. Please grant us truth, insight and understanding. Please grant us faith, tolerance and kindness. Please help us be the best we can be. Please protect us and keep us from harm. Please keep us safe and return us home with our loved ones each day. I ask this in love and light, for the highest good, no harm be done. Bless you and this day. Thank you for all you be and all you do. On the days I have more time I sit with the energy and the light but otherwise these few valuable moments recharge both my personal energy and the source from which it derives and exists. My process of coexistence with and asking guidance of the Universe has somewhat evolved. I remember the first time I deliberately asked for assistance. I can still see me, time and place. Not in the warmth and privacy of my bed. Walking along a city street in the middle of the day, I’d had enough. I threw my worries and cares up to this energy. There were no magic effects, nor immediate tangible change except I no longer felt I alone had to resolve them. Sometimes asking is the smartest but hardest thing to do. “You think you’re lost but you’re not lost on your own. I will help you through when you’ve done all you can do. This entry was posted in Blog and tagged Australia, my life, spirituality. Nice prayer. Mine is simpler: Let me do no harm, but only good today. May my kindness outweigh my smallness of spirit. May those I love be safe and well. And now, give me the energy to get out of bed and do what must be done today! Quite thought provoking! 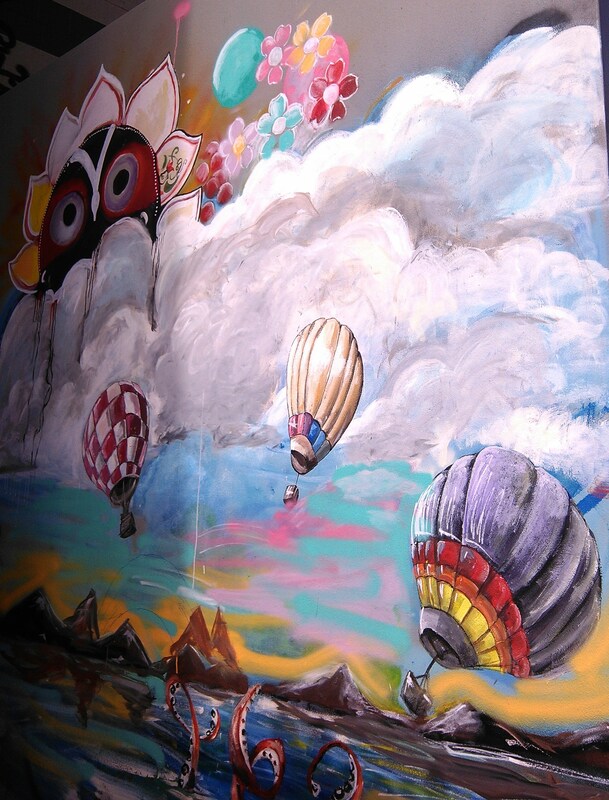 Love the balloon art work, so much better than the crappy graffiti we have to endure looking at. Thank you. There’s plenty of crappy graffiti-tagging although there’s some quite talented stuff, as well as amazing street art… one of the things I love about living here. Beautifully written, Dale. I believe there is an energy that is everywhere and makes up everything too. I never feel alone or unsupported, it is there always. I agree there’s an interconnecting energy in the World but that so few people tap into it or acknowledge it. That gives them the opportunity to do untold damage to the World without thought as to what it might do. or how it diminishes the energy. I like the prayer, what a great way to start the day. I start the day so grumpily that this would be a really good idea. My upbringing had me praying (or whatever you like to call it) in the evening but not in the morning. I Never too late to learn a better way to start the day. And I really like the idea of throwing everything up in the air. Thank you, Elladee, for making me think. And for connecting of course. Another one of your delightful, thought provoking posts — thank you. This quote has been resonating with me over the last few months: “Wake at dawn with a winged heart and give thanks for another day of living”. Not sure about the dawn part, but I love the idea of a winged heart! It reminds me that my day is precious and that I need to be open to the universe. A winged heart is a beautiful thing, one that beats freely and strongly, that is both nurtured by and nurtures love and light. Definitely. I really like that because it adds so much to my original. I like the idea of making a conscious decision about how the day is to be used, that we are exchanging the day for how we live it. It also fits with Kate’s thought of “let my smallness of mind be out weighed by my kindness.” Again, thank you for provoking my thoughts. Funny, I just commented on another blog that was about Oneness. Then, I clicked over to this one. I very much can relate to what you wrote. And, your last quote reminded me of the poem, I Am There. If you haven’t read it, I highly recommend it. The link to it is on my poetry page. Thank you for sharing this. It’s always nice to connect with kindred spirits. Thank you. I just read I Am There. I hadn’t encountered the poem before. It says it beautifully. I liked your preface… I wander into spiritual or political areas only occasionally, and gently! To connect rather than preach. Thank you. I do that as well, remember to say thank you for just being, and the little bits of day to day support. When things are tough, it’s even more important to be grateful for the additional energy that gets us through. That prayer is so beautiful Dale. The practice of saying a prayer when you awake is lovely. So lovely in fact, that I want to do it too! I love your and Kate’s prayer. My Buddhist girlfriend always shares some beautiful words of wisdom with me , the one that I remember right now is ” my we all find peace ” When I was working I used to meditate every morning for about 20 minutes. Now, that I’m retired, I walk the beach instead . Thank you. I love Kate’s prayer to, and have printed it our to tuck into the mirror frame. Walking is my favourite kind of meditation, and along the beach even more so. For me it’s where the worlds meet. Thank you, for the kind words. Even considering the energy which connects us is omniscient, asking for help helps us help ourselves. And giving thanks and blessings underscores gratitude. Thank you 🙂 Dog walks (remember God is dog spelled backwards! ), any walks so do count. When I walk I often feel my consciousness slip away and/or the portal open for higher thoughts.